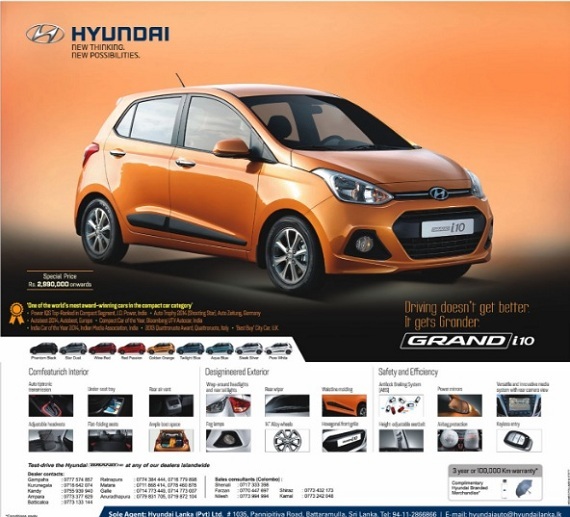 Good news Hyundai Grand i10 now available in Sri lanka. Hyundai i10 or Hyundai Grand i10 is smart premium style 5 door hatchback car produced by Hyundai Motor Company now you can buy in Sri lanka. Hyundai i10 officially launched in Sri lanka by Hyundai Lanka (Pvt) Ltd. Hyundai i10 price in Sri lanka Rs : 2990000.00 (Basic model). Hyundai i10 comes with modern and compact design, stylish exterior and interior (Air conditioner, Front and rear power windows, 2 DIN Radio,CD,MP3 audio) and Superior fuel efficiency. Hyundai i10 is sold in the following colours in Sri lanka. There Pure White, Sleek Silver, Wine Red and Star Dust. Hyundai i10 powered by 1086cc Petrol engine and Manual transmission system. Hyundai i10 car recorded high Fuel efficiency 19.8 kmpl . 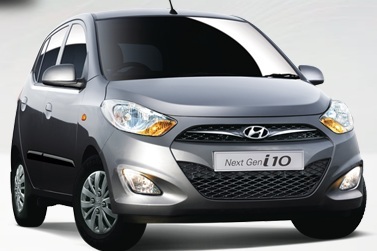 If you wish to buy Hyundai i10 in Sri lanka, call Hyundai Lanka Customer care Hotline 0112 866 866.